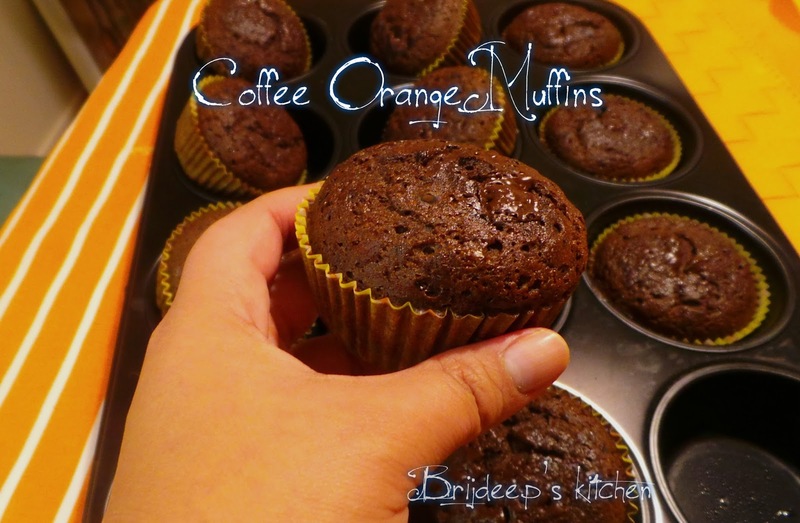 Banana chocolate muffins are the most favorite in my household and is a mandatory preparation every weekend to prepare and stock for the week to be eaten as tea time snack. This time I was in an experiment mode and wanted to try a different flavor. But hubby wanted to keep the chocolate flavor intact. 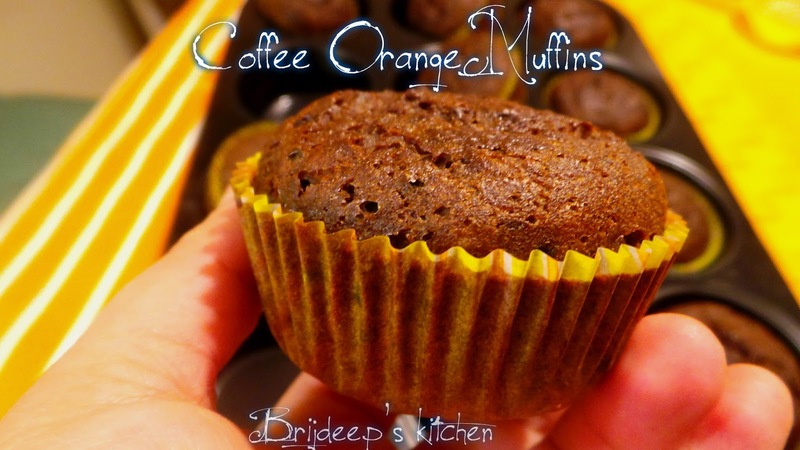 So made these coffee orange muffins using whole wheat flour. They turned out to be yummy and was a good change for our tea time! 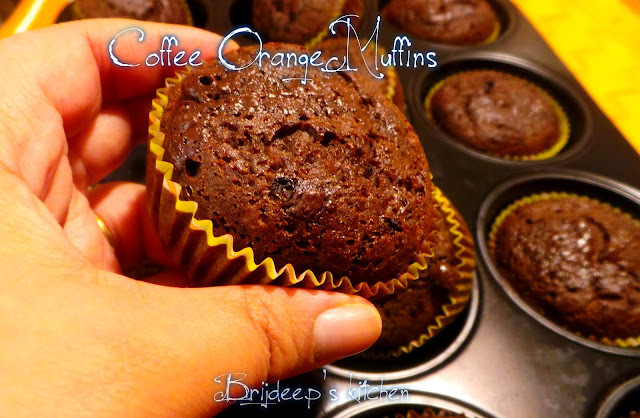 Cocoa powder: 1 heaped tbsp. Begin by sieving the whole wheat flour in a big mixing bowl. Sieve in cocoa powder, coffee and the baking soda. In another big mixing bowl, add the sugar. Break the eggs in the bowl and beat it well. Do not over mix. I used a hand whisk. Now add the orange juice and mix well. Add the oil, yogurt and the orange essence. Mix everything nicely with the help of whisk. You can also use the electric mixer. 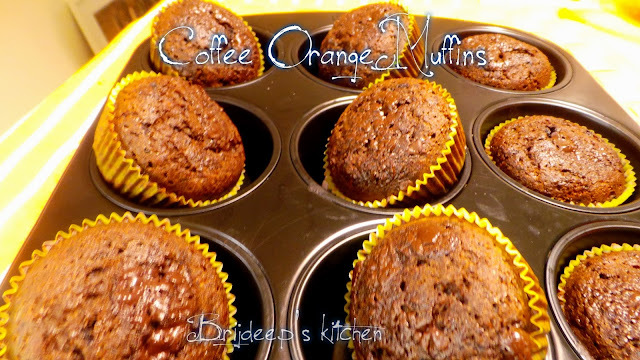 Spray the muffin molds (I used paper molds) with very little oil. Fill in the mixture in all the molds up to half. Bake for 30 minutes at 200 C. Then do the toothpick test. Insert a toothpick in the middle of the muffin, it should not have the batter stuck to it, it should come out clean with little crumbles. If not done, bake for a little more time until the toothpick comes out clean. Remove and serve warm with tea. Let cool completely and it can be stored for up to a week in the refrigerator in air tight container. Enjoy! 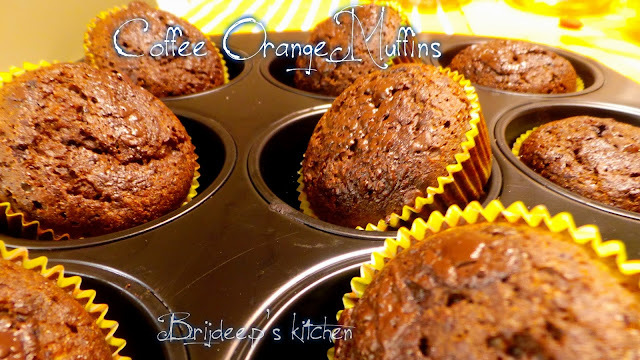 You might also like Whole wheat banana chocolate muffins. Thanks for reading this. If you loved this recipe, do share this with your friends and please do leave a comment/feedback in the comments section below. Also, don't forget to connect with me on Facebook for more updates! These pictures represent so much of autumn weather. Trees color looks so relieving to eyes. I like the orange shade more. I would like to read more articles on it.